The Viborg-Hurley Middle School, in partnership with the Daneville Inn, launched its new reading incentive program this February. Bi-monthly, all VHMS students in grades 5 and 6 are presented with a reading goal to increase reading comprehension, oral reading fluency, and exposure to new genres. Students are encouraged to complete reading their chapter book, and corresponding activities within the two-month time frame; with many exceeding the initial goal set! 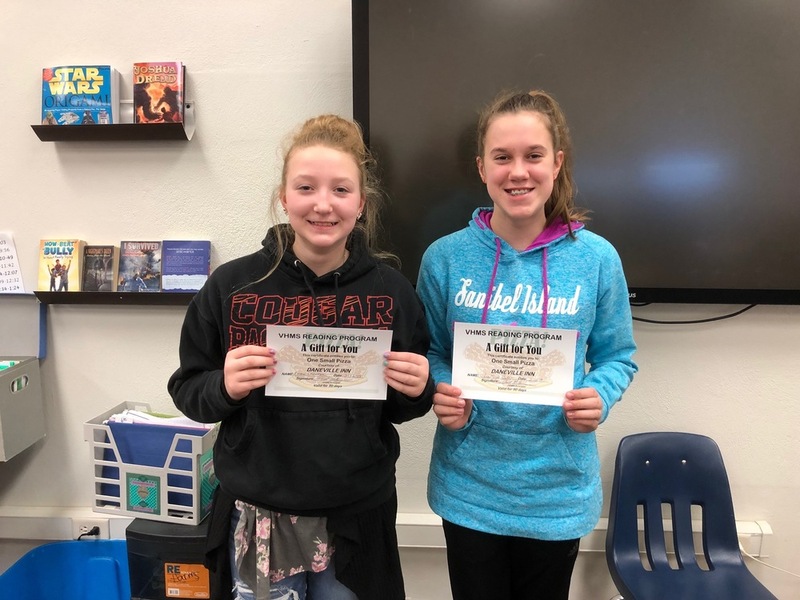 In an effort to keep business local, VHMS has partnered with the Daneville Inn in Viborg to provide the students, who successfully meet their reading goal, a certificate for a small pizza. “Any time the community wants to be involved in a student’s educational experience, it’s a win-win for the Viborg-Hurley School District. The Daneville Inn has been gracious enough to partner with us to reward VHMS students for reaching their reading goals. We have been running the program for a few months and the excitement we’ve seen in students when they receive the reward and positive peer support has been great for the environment at VHMS. Thank you to everyone at the Daneville Inn and owner Jeff Christensen for making this program reward possible” said Viborg-Hurley Middle School Principal Mr. Mellem. Pictured above: VHMS 6th grade students Emma Chaussee and LaMiya Baker receive their Daneville Inn pizza certificates. Copyright © Viborg-Hurley School District 2019. All rights reserved.